The national government’s total borrowings rose to P947.55 billion in 2018 as it increased its credit from foreign lenders and other development partners, according to the Bureau of the Treasury (BTr). Chinese President Xi Jinping’s state visit to the Philippines in November 2018 was the first by a top Chinese leader in more than a decade, marking the culmination of an ongoing rapprochement between the two countries. The government may continue to operate on a reenacted budget, at least until August, and this could affect the country’s growth as it remains uncertain when the Senate and House of Representatives can transmit the P3.7-trillion General Appropriations Bill (GAB) for 2019 to President Duterte for signing into law, Sen. Panfilo Lacson said yesterday. Public spending on infrastructure amounted to P1.64 trillion in the first 10 quarters of the Duterte administration, or equivalent to four percent of the country’s gross domestic product (GDP), according to the Department of Finance (DOF). The chairman of the House Committee on Appropriations on Sunday night disclosed that Senate has post-bicameral realignment amounting to P75 billion to the P3.757-trillion 2019 national budget, P25-billion of which was parked in the budget of the Department of Public Works and Highways (DPWH). 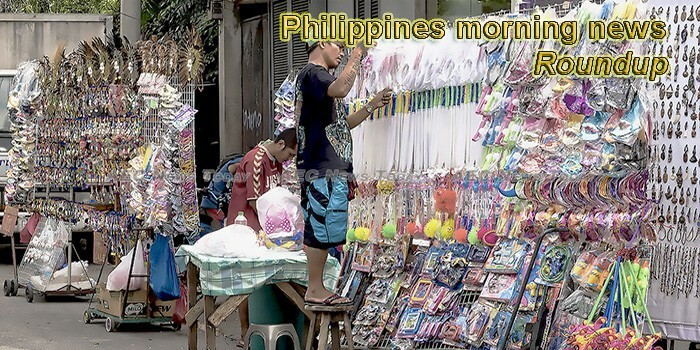 The domestic economy had savings of P3.862 trillion in 2017, up 11.1 percent from 2016, as all sectors were declared “savers” on profitable operations and expansion activities despite external risks, according to the Bangko Sentral ng Pilipinas (BSP). THE NUMBER of dengue cases in Iloilo province stood at 669 as of March 2, according to the Iloilo Provincial Health Office, much higher than the 171 reported for the full year 2018. Department of Finance Carlos Dominguez III said that by the end of the Duterte administration, government spending on infrastructure is expected to be equivalent to 7% of Gross Domestic Product (GDP). The Monetary Board, the policy-making body of the Bangko Sentral ng Pilipinas (BSP), has extended up to January next year the observation period for subsidiary banks’ compliance with Liquidity Coverage Ratio (LCR) and Net Stable Funding Ratio (NSFR) to allow more time to adjust to the new metrics. The Subic Bay Metropolitan Authority (SBMA) registered a seven-year high investment figure in 2018, as more investors expanded operations or set up their businesses in Subic amid strong confidence. The Department of Finance (DoF) said it remains committed to the major economic policies of the Duterte administration, particularly on increasing foreign direct investments (FDI) and government spending. Monetary authorities will likely move to relax policy beginning May via interest rate cuts that will total 100 basis points this year, a banking giant said. About P55.3 million worth of crops in Davao Region were reported to have been destroyed due to the dry spell brought about by the current El Niño. The Philippines is losing billions of dollars in potential mining investments because of policy stalemate hounding the industry, an independent think tank said. ISRAELI firm Ratio Petroleum Ltd. wants to partner with Philippine National Oil Company-Explo-ration Corp. (PNOC-EC) to jointly explore possible petroleum reserves in the east Palawan basin. The Philippines is once again setting record levels in terms of buying rice in the world market as it is expected to be the second-largest global importer this year at 2.6 million metric tons (MMT) of rice. The United States is keen on expanding its farm exports to the Philippines once nontariff barriers—as committed by the government—are removed this year. At least P79 billion worth of projects in the Congress-ratified 2019 national budget have been manipulated by some members of the House of Representatives, Senate President Vicente Sotto III said yesterday. In yet another about face, President Duterte on Friday said he would not legalize marijuana in the country as it can be used for purposes other than the treatment of ailments. The country’s oil import bill has risen by a substantial 31.8 percent to $13.477 billion in 2018 from the 2017 level of $10.228 billion on the exponential rise in world oil prices for nine months last year. The Philippines was among the three “most dangerous” places for women among 14 Asia-Pacific countries covered by a report of research firm ValueChampion that measured women’s safety, healthcare and access to education and employment opportunities. Following the groundbreaking for the 38-km. Tutuban- Ma lolos s egment of the Nor th-South Commuter Railway (NSCR) project last February 15, the pre-bid conference on the first three civil works contract packages of the NSCR’s 53-km. Malolos-Clark segmentwas held last March 7 at the Asian Development Bank (ADB) headquarters in Pasig City. The peso faces the possibility of closing at 53.50 to the dollar by the end of the year, according to Justin Valle, research associate at the Ateneo Center for Economic Research and Development. Senate President Vicente Sotto III on Sunday said he is happy that President Rodrigo Duterte backtracked on his stand on the legalization of marijuana. Over 800,000 individuals have been arrested since June last year in Metro Manila for violating various ordinances, according to National Capital Region Police Office (NCRPO) report released on Sunday. The Commission on Audit (COA) affirmed its decision to hold former Baguio City mayor Reinaldo Bautista and 16 other former and current officials liable for granting P63.72 million in unauthorized allowances to city officials and employees in 2008 and 2009. San Miguel Corporation (SMC) has spent over ₱5.6 billion for social and environmental initiatives across its businesses, the firm said in a statement Sunday. An audit in the Philippines has shown the country uses a “shocking” amount of single-use plastic, including nearly 60 billion sachets a year, a new report said Friday. Due to insistent public demand, Philippine flag carrier Philippine Airlines is extending its 78th anniversary seat sale for seven (7) more days – March 11 to 17, with an additional one million seats up for grabs. Hanjo Group Manufacturing Inc., a Korean firm on Thursday entered into a memorandum of understanding with the provincial government to build a $1billion 600-megawatt thermal power plant in Bataan. Three senatorial candidates said that the government must launch an intensified information drive promoting vaccination amid a spike in measles cases in the country. The Senate may call in economic managers to question the proposal to liberalize sugar imports, Senate Majority Leader Juan Miguel Zubiri said on Saturday, March 9. At least 1,000 members of the National Research Council of the Philippines (NRCP) are expected to attend its annual scientific conference and general membership assembly on Monday at the Philippine International Convention Center (PICC) in Pasay City. A total of 332 cities and municipalities in the country don’t have fire trucks, the Bureau of Fire Protection (BFP) said yesterday. The Presidential Task Force on Media Security (PTFoMS) on Sunday claimed that there were significant developments on two cases of media killings: one in Davao del Norte in 2018, and the other in Surigao del Sur in 2017. President Rodrigo Roa Duterte on Friday, March 8, mandated the Department of Agrarian Reform (DAR) to distribute government-owned lands, including the ones in the mountain areas to Agrarian Reform Beneficiaries (ARBs). Manila Water on Sunday released an updated list of areas which will have little to no water supply in the coming days. SENATORS are open to a law that institutionalizes the government’s intensified infrastructure development program to ensure continuity of flagship projects after President Rodrigo R. Duterte’s term ends in mid-2022. As a group of ex-rebels welcomed the move of European leaders to look into the information presented by the Philippine government on the reported funding of EU-member countries for activities of the Communist Party of the Philippines (CPP), it said the communist group also receive funds from Filipino-American communities in the US and Canada. The upper house is desperately looking for ghosts in the 2019 budget, House of Representatives Appropriations Chair Rolando Andaya Jr. said Sunday. Department of Health (DOH) 4-A (Calabarzon) has intensified its anti-measles mass immunization campaign in the region through the Nurse Deployment Program (NDP). The LandBank Plaza in Malate, Manila was recently conferred with the Leadership in Energy and Environmental Design (LEED) v4 Gold Certification. Avoid coffee and tea for now to avoid heat stroke, the Department of Health (DOH) advised the public yesterday. The Technical Education and Skills Development Authority (TESDA) is pursuing a case against 11 officials accused of rigging the bidding for the purchase of P1.4 billion worth of special tool kits to favor a contractor. PLDT, Inc. said it may have to wait until next year or 2021 to see a turnaround in Voyager Innovations, Inc., after the digital innovations unit welcomed new foreign investors last year. Stronger provisions for wiretapping are among the proposed amendments to the narcotics law, according to Dangerous Drugs Board (DDB) chairman Catalino Cuy. Senate candidate Mar Roxas’ campaign manager, Caloocan City Rep. Edgar Erice, said that Roxas would do anything to serve the country and its citizens, even direct traffic when no one is there to do so. “Avoid corruption and help the poor who need legal services,” is a life principle of Nelson B. Borja, a senior trial lawyer specializing in criminal cases, who distinguishes himself by providing free legal service to the poor.